Imperial splendour, UNO-City, wine taverns and hip-hop: Vienna truly is a place, which thrives on contrasts. Come and experience the city in the comfort and atmosphere in typical Fleming’s style. 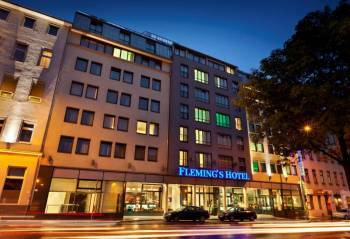 The 4-star Hotel Fleming’s Conference Hotel Wien is situated in a central location opposite Vienna Westbahnhof train station. It lies in close proximity to shops and restaurants, which await you on your visit. Mariahilfer Straße with its many shops, the Viennese City Hall and the Raimund Theatre are all just a few minutes’ walk away. Vienna’s city centre can also be reached by underground/tram in just a few minutes. You are also only 1.5 km away from the Technical Museum and the Haus des Meeres public aquarium. There is also a direct connection to the airport by bus. In a conference space of 880m², there are 11 fully air-conditioned and soundproofed conference rooms with natural light for up to 250 people, located over two floors. The meeting rooms all face onto a beautiful internal courtyard and are very quiet and bright. That is why we are able to offer you the ideal setting to meet your needs and requirements. Professional on-site support ensures your event becomes a special experience. Over the following pages, we provide you with the most important information about our conference facilities. Our team is happy to personally advise you on banquet orders and is on hand as your professional partner to assist with the planning, organisation and implementation of your event.